Gore Verbinski, best known for directing the first three “Pirates of the Caribbean” films, has earned the right to do make a film for himself--the result is “Rango,” the story of a chameleon suffering an existential crisis. It's also pretty clearly about Verbinski's own identity crisis. The film begs, borrows and steals from “Chinatown,” “Fear and Loathing” and “Apocalypse Now” among other classics, in telling the story of Rango. When we first meet the lizard, he’s staging a Shakespearean tragedy, directing and acting alongside a plastic palm tree, a wind-up toy fish, a dead bug and a Barbie torso with one arm and no head. After "discussing" the scene with his cast mates, Rango realizes that his character lacks shape, definition, there's a lack of tension in his life. Just as this epiphany is taking shape, a near-death experience strands Rango in the middle of the desert, he must head off into the horizon in search of water. He soon comes across a town called Dirt, where he quickly becomes sheriff entirely by accident, and the locals demand he find out what's happened to their water supply. Verbinski's first hit was his remake of "The Ring," after which he did his first "Pirates" film before doing "Weather Man," and then returning to the "Pirates" for his next two features, before walking away from the franchise. 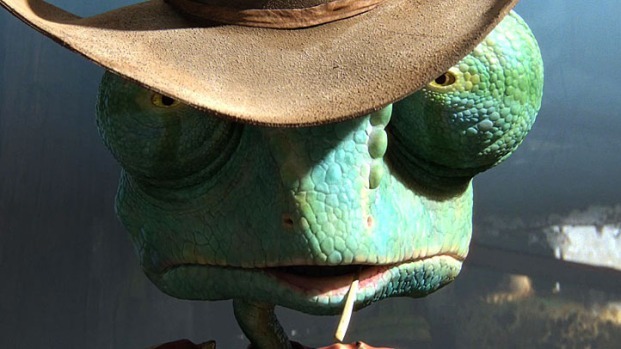 Watching Rango, Verbinski clearly felt the need to bust out of the rut in hopes of finding his own voice. "Rango" has allowed him to tackle about six different genres, and he deftly handles each shift in action and tone, whether it's an "High Noon" showdown or a dogfight. Johnny Depp is Rango, a chameleon going through an identity crisis, who accidentally becomes the hero and then sheriff of a small desert town. Written and directed by "Pirates of the Caribbean" director Gore Verbinski, the film comes out March 4. In directing the action for “Rango,” Verbinski did something revolutionary for the animated film genre: he had his actors play out the scenes with one another, rather than read their lines from the isolation of a sound booth, and had his animators draw scenes off the actors’ movements. Working this way not only got Verbinski better performances from his actors, it also allowed him to maximize his cast’s talents—you can see the Johnny Depp’s physicality comes through as Rango moves about. "Rango" is a funny and inventive adventure, ranking as one of the more entertaining attempts by an artist to work through a personal crisis. Oh, and it has a great cameo from one of the most iconic heroes in movie history.